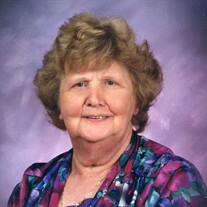 Diana Margaret (Crites) Sherman, age 80, of Moorefield, WV completed her journey on Tuesday, December 19, 2017 at Grant Memorial Hospital in Petersburg, WV. Mrs. Sherman was born July 12, 1937 in Petersburg, WV and was a daughter of the late Jesse E. Crites and Ruth Mae (Shook) Crites. In addition to her parents, she was preceded in death by an infant son, Rex Sheldon Sherman; four sisters, Virginia Messoria, Jessie Iman, Neva Massimo and Thelma Crites; four brothers, Elwood Crites, Keith Crites, Elmer Crites and Darl Crites. Diana went to school in Petersburg and enjoyed lunches with friends from school for many years. She attended Rig Assembly of God Church and later Moorefield Church of the Brethren where she served on committees, attended seminars and meetings. She always helped with the preparation of church meals to raise money for various groups or activities. She was a hospice volunteer for many years. Although she lost everything in the flood of 1949 and again lost everything with the destruction of her home by fire about 12 years ago she had a generous spirit that helped to guide her and others. Diana was an outstanding mother, a loving grandmother and an excited great grandmother with her first great grandson having arrived this year and expecting another great grandchild next year. Diana will be remembered daily by family and friends. Diana is survived by two sons, Lloyd and wife Faye, and their three sons Tyler and wife Sarah, Brandon and Tanner; Timmy and wife Libby and their son, Harley; three daughters, Donna Jeffers and husband Paul and their son, James Wesley; Margaret Sherman Murrell and her two daughters, Aurora Murrell and Amelia Girard and husband Matt and their son Clattie Marvin Jude; JoAnn See and her son, Tucker Riggleman and her daughter, Morgan Grace See; three sisters, Lenora B. Crites and husband Kenneth , Mary Lou Hardy, Wanda Sears and husband Johnny; numerous nieces and nephews and a first cousin, Junior Shook. Funeral service will be held on Saturday, December 23, 2017 at 3 p.m. at the Rig Assembly of God Church with Pastor Brad Taylor and Pastor Russell Webster officiating. Family will receive friends at the church from 1 - 3 p.m. She will be laid to rest next to her infant son, Rex in the Critestown Family Cemetery. If desired a donation may be made to Charity of Choice.